I love old architecture. Give me a 100 year old house any day over a newly constructed one. In fact, if money was of no concern I would have a blast renovating old homes. I also love Portland, especially since over that last couple of decades it's gone through a great rebirth and areas that were once blighted have reemerged as hip neighborhoods. When I was in college there in the 80s the Pearl District was a bunch of run down warehouses and scummy. Now it's trendy lofts, bistros and boutiques. Back then all the good restaurants were downtown on the west side of the river. Now most of the best restaurants are sprinkled throughout the revitalized neighborhoods on the east side of the river. 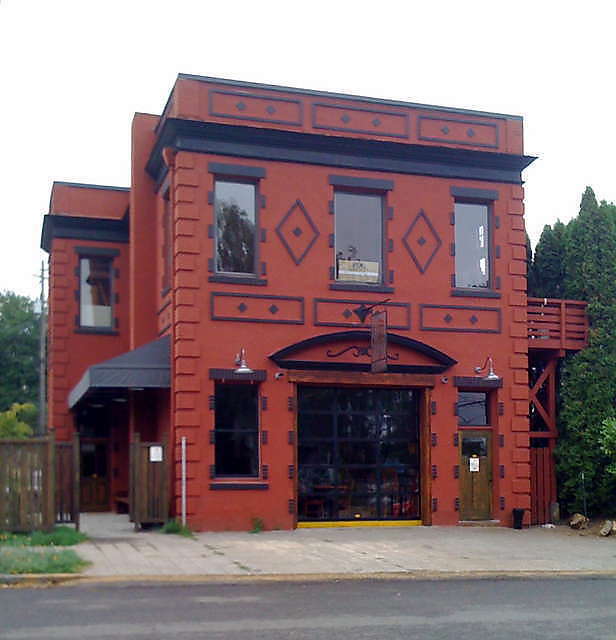 Recently I found an architectural gem in Northeast Portland that is one of the top eateries if you go by Eater.com Portland. The Firehouse is in the Woodlawn area and was built as a functioning firehouse back in 1913. This beautiful brick structure stands on a triangle block in the middle of what must have been a lively blue collar neighborhood. Inside there is plenty of wood detail and the wonderful garage door that is rolled up when the weather is nice. Sadly they don't have a fire pole (Sacramento's Firehouse restaurant has them beat in that one detail). On the walls there are vintage photos showing past fire brigades that occupied the station. I am here to meet my college friend for dinner. The Firehouse garage door is open because for Portland it's a warm day. For Sacramento me, there's a bit of a chill. That's the reason I've opted for indoor seating than outdoor, where they have a nice patio. 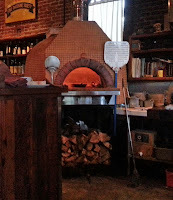 A large wood fire oven has been built in the kitchen area. I can't help to think of the bit of irony of having a small, raging fire in the Firehouse. A nice feature at the bar, a seltzer spout so that I get freshly dispensed soda water in a swingcap liter bottle. We start off with a plate of blistered peppers. I can't remember what type they were, but they weren't Shishitos, so popular in California. These were smaller but nicely blistered in a hot pan and then tossed with a bit of olive oil and sea salt. These were handled carefully with the perfect amount of salt. My girlfriend saw the pizza oven and knew immediately what she was having. 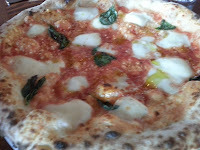 She opted for a Margherita Pizza. We watched the dough being tossed, topped with cheese and a bit of basil, and served quickly from the oven just 10 feet away from our table. I chose the wood-grilled hanger steak with crispy potatoes, arugula and grana padan. 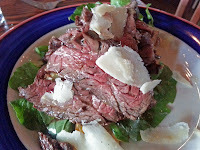 It was a perfect medium rare and had been rubbed with just some rosemary and salt. I enjoyed the evenly browned, roasted potato slices and the fresh arugula. 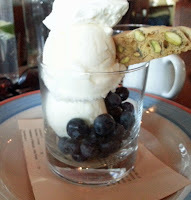 This was farm to fork Portland style. 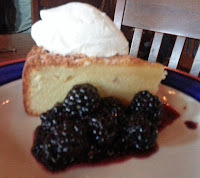 I was a little disappointed in my almond cake with berries in that I had expected a more rustic cake made with more almond meal than flour. This was more of an almond pound cake with obvious almond extract added for the flavoring. Still, it was delicious cake paired with fresh Oregon blackberries that are so bountiful here. 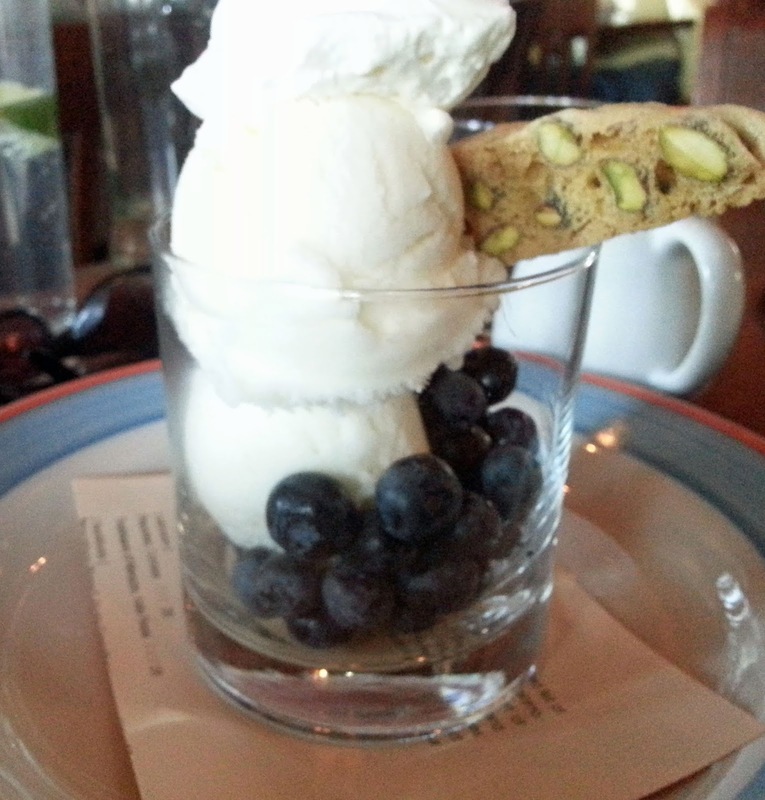 Julie has a penchant for buttermilk and so she selected the buttermilk sorbet. She felt the touch of lemon overtook the buttermilk flavoring, but still enjoyed it very much. Overall, I was very pleased with our visit to the Firehouse. 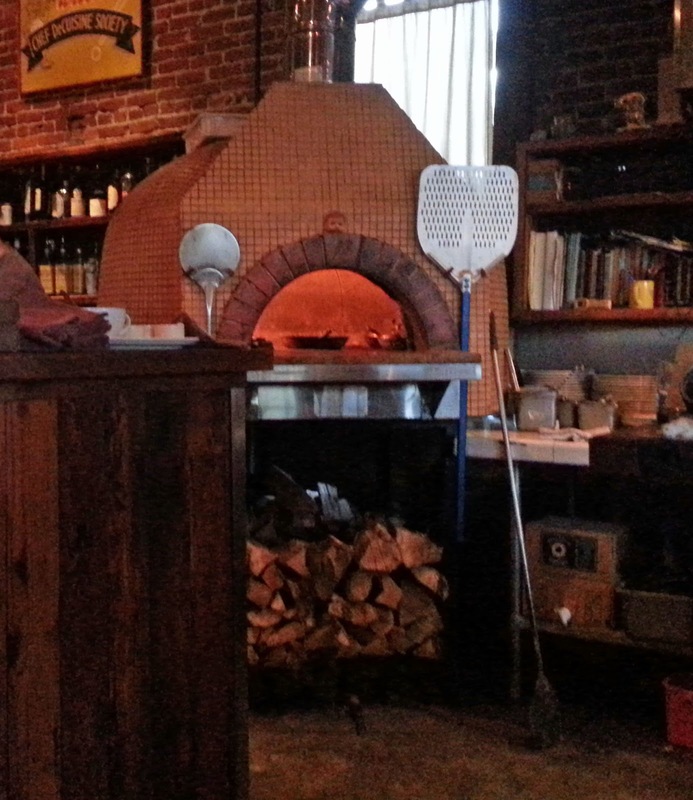 The food is Oregon farm to fork with an emphasis on the pizza oven and wood fired grill. You can't beat it for charm either. It will be off the beaten path for many Portland visitors, but worth a trek away from downtown.